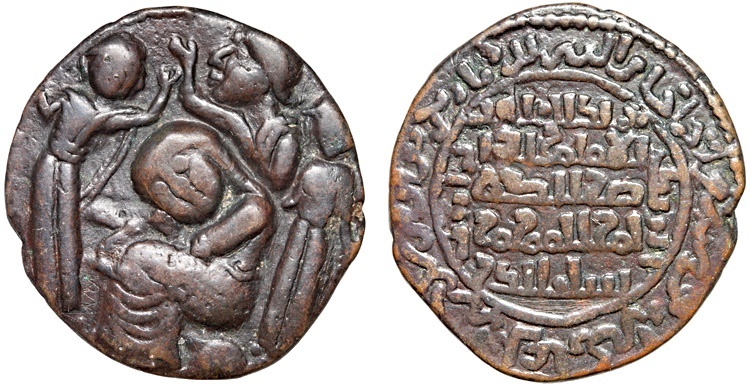 Artuqids of Mardin: Husam al-Din Yuluq Arslan Æ dirhem, 580-597 AH (1184-1201 AD), 11.71gm, struck 589 AH (year of Saladin’s death), 29.9mm. Obv: Three figures in various poses surrounding a central seated figure in a posture of mourning. Rev: Five line Kufic legend giving names and titles of the Abbasid caliph al-Nasir, surrounded by a circular legend giving the names and titles of Yuluq Arslan and the date. S&S 35.2; Album 1829.3. VF, pleasant brown patina. The figures on the obverse may represent actual citizens in mourning for Saladin. Alternatively, they may be symbolic representations of astronomical/astrological entities which were said to have predicted the death of Saladin, and then mourned him – so exceptionally great was the tragedy of his passing that the stars and planets lamented (see Spengler & Sayles, Type 35 section for more details of this latter theory).